oil on canvas, 26" x 36.5"
A Catalan born at Montroig near Barcelona, Joan Miró is one of the greatest talents of surrealism and a master of 20th-century painting. . . . His first independent paintings, 1916-1918, show that Cézanne and Van Gogh affected him most. In Portrait of E. C. Ricart, 1917, . . . lines and colors suggest influences from the fauves and perhaps Chagall. . . .
Miró was also painting landscapes of his beloved Catalonia, interpreted either with extremely delicate color and linear movement, or in a cubist vein. 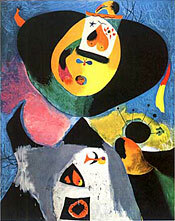 The contemporary artists whom Miró was beginning to admire were Matisse and a fellow Spaniard, Picasso. . . . From Matisse he learned how large areas of color and pattern could flatten and control his picture plane. . . .
Miró had become acquainted with the works of the leading avant-garde artists of Paris through reproductions and exhibitions in Barcelona. On his first visit to Paris, in 1919, he warmly received by Picasso, met the leaders of French art and, perhaps through Picasso, became utterly fascinated with Rousseau's painting. . . . Spending winters in Paris and summers in Montroig, the artist continued until 1924 to paint in the vein of geometric, primitive realism. In a group of paintings of 1923-24, he moved into the realm of fantasy, formulating his vocabulary of the marvelous--almost a new language of 20th-century art. 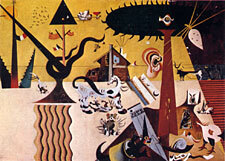 Miró had admired Picabia's machine fantasies in Barcelona in 1917; during his first Paris years he had naturally been drawn to the dadaists; Klee's work enchanted him; and he was particularly friendly with Breton and the other poets who soon launched the surrealist revolution. . . . Catalan Landscape (The Hunter) of 1923-24 . . . is one of the first examples of Miró's wonderful world. It is difficult to explain so sudden a transition, and the individuality of the fanciful new style. Among the dadaists the only analogy was Jean Arp's biomorphic abstractions. The relationship of Miró and Arp is close, however, and is based largely on their common love of organic shapes and their somewhat similar humor. . . .
oil on canvas, 26" x 36.6"
The salient points of Miró's art are not iconographical or structural. 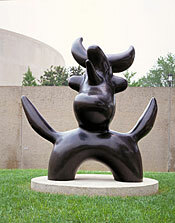 One element is fantastic humor, of which he, Klee, Arp and, slightly later, Alexander Calder are the modern masters. 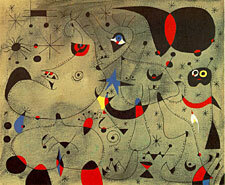 The other salient point is the vividness of Miró's unreal world. His organisms and animals, even his inanimate objects, have an eager vitality that makes them more real to us than the crowds we pass daily. In the late 1920s and early 1930s Miró began to experiment with collage and assemblage, and to create the monster figures which he continued for another decade. 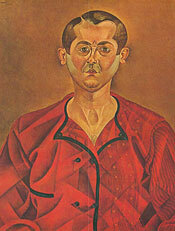 Most impressive was the group of large paintings of 1933, his most abstract up to then. A number were based on collage elements, realistic details torn from newspapers and pasted on cardboard. 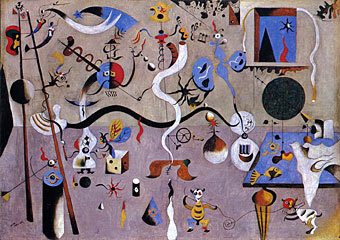 The motifs--tools, furniture, dishes, and glassware--suggested to him abstract-organic shapes, sometimes with implied faces or figures. . . .
After this quiet and abstract interval, Miró continued his savage paintings; Nursery Decoration, 1938, is the largest. Although violent--black and red monsters on a ground predominantly brilliant blue--the beasts are not particularly alarming. One feels the artist's affection for even the fiercest creatures of his imagination. . . .
With the outbreak of World War II, Miró settled permanently in Palma de Mallorca. The isolation of the war years and the need for contemplation and revaluation led him to read mystical literature and to listen to the music of Mozart and Bach. Until 1942 he worked on the small gouaches entitled Constellations, which are among his most intricate and lyrical compositions. These works recapture the delicate beauty and gaiety of his paintings of the 1920s, but the artist was now concerned with ideas of flight and transformation as he contemplated the migration of birds, the seasonal renewal of butterfly hordes, the flow of constellations and galaxies (The Poetess, 1940). . . .
By the end of World War II, Miró was working on a large scale, with passages of heavy paint or luminous, atmospheric color. . . . On the varied ground the artist constructed objects, signs, and figures with rough, heavy brush strokes and intense color. He also began working with the ceramist José Artigas, creating pottery, ceramic sculpture, and finally ceramic-tile murals of great strength. . . .
During the 1970s Miró, one of the last surviving old masters of modern art, not only continued to paint energetically and brilliantly, frequently on a monumental scale, but produced some of his most impressive and grand-scale sculpture.